The ketogenic diet has been demonstrated to have a wide variety of benefits spanning multiple populations including the treatment of epilepsy, type-2 diabetes, neurological disorders, weight loss, endurance performance and even certain types of cancer treatments (1-5). The hallmark of a well-formulated ketogenic diet is a rise of ketone bodies which happens following a prolonged period of carbohydrate or caloric restriction (i.e, fasting). Ketone bodies are produced in the liver as an alternative fuel source to carbohydrates and measuring ketones is a way to determine the degree of ketosis someone is in. The two primary methods for measuring ketones are via blood and breath testing. There are a number of consumer devices on the market to support either method. Having a central location to track ketone values can help you fine tune your approach on the ketogenic diet. 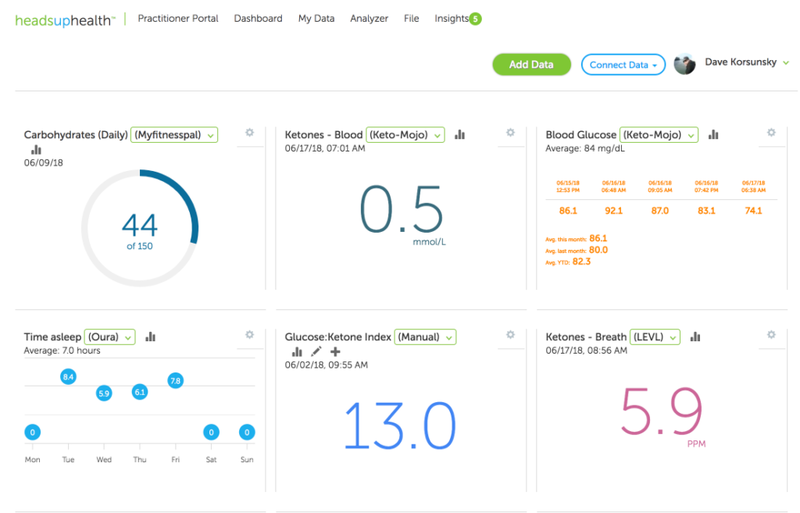 The Heads Up Health web app is designed specifically to help you track ketones alongside all of your other vital health data. You can start your free 30-day trial (no credit card required) using the button below. Or, read on to learn more about the difference between blood and breath ketone testing. Being able to frequently and accurately measure the level of ketosis can be important for those following the ketogenic diet for clinical purposes as well as for overall health and performance. Due to individual variability in response to different types of food, having frequent feedback will aid individuals towards improving their understanding of how their body responds while increasing motivation and adherence. This need has led researchers and practitioners to be on the look-out for fast and accurate methods to assess ketone levels. Traditionally, ketone levels have been assessed via urine strips and while this method may be easiest, it is not the most practical. This method measures the excretion of ketones and wasn’t intended for people following a ketogenic diet; rather it was intended for those suffering from conditions such as diabetic ketoacidosis. This is because urine strips test for unused acetoacetate rather than the main ketone that our body does use, B-hydroxybutyrate. In the ketogenic space, measuring the blood B-hydroxybutyrate concentration is the standard protocol. While this method has been shown to be more accurate than urine tests, these blood assessments may be troublesome for children and elderly, and could become expensive (requires a constant supply of blood strips), and not as practical outside of a clinical setting. Recently, researchers have identified breath acetone assessments as a practical and accurate method to determine level of ketosis (6). In healthy individuals, resting acetone levels may range from 0.5 to 2.0 ppm. Individuals following the ketogenic diet can see levels of acetone up to 40 ppm. Individuals undergoing a prolonged fast may see elevated levels up to 170 ppm. Lastly, uncontrolled diabetes and subsequent ketoacidosis may lead to acetone levels of 1250 ppm (8). It is also interesting to note that as acetone is a byproduct of fat metabolism, it can also be used to measure the rate of fat loss (9). Connect the LEVL breath ketone analyzer and instantly sync your readings. Learn more. Connect the Ketonix breath ketone analyzer and instantly sync your readings. Learn more. Easily track Keto-Mojo readings on your Heads Up dashboard. Learn more. Track ketones from other blood meters. Learn more. Create your own personal dashboard with the metrics that matter most to you! While blood assessments are a great way to measure ketosis, breath acetone assessments also appear to be a fast and accurate measure to determine the degree of ketosis. This is not to say that blood assessments should lose any of their value as they are still extremely valuable and should be taken in conjunction with breath assessments. However, the major benefit to breath assessments is the practicality of breath ketone levels as it can be assessed frequently with no invasive procedures helping individuals maximize their ketogenic diets! Heads Up Health lets you track all types of ketone measurements – urine, breath and blood – so you can choose the method that works best for your lifestyle and budget. Additionally, the LEVL and Ketonix breath ketone meters can be electronically linked to your Heads Up Health account so readings will be synchronized automatically and can be tracked alongside all of your other vital health data. Start your free 30-day trial today! 1.) Neal, E. G., Chaffe, H., Schwartz, R. H., Lawson, M. S., Edwards, N., Fitzsimmons, G., … & Cross, J. H. (2008). The ketogenic diet for the treatment of childhood epilepsy: a randomised controlled trial. The Lancet Neurology, 7(6), 500-506. 2.) Westman, E. C., Yancy, W. S., Mavropoulos, J. C., Marquart, M., & McDuffie, J. R. (2008). The effect of a low-carbohydrate, ketogenic diet versus a low-glycemic index diet on glycemic control in type 2 diabetes mellitus. Nutrition & metabolism, 5(1), 36. 3.) Gasior, M., Rogawski, M. A., & Hartman, A. L. (2006). Neuroprotective and disease-modifying effects of the ketogenic diet. Behavioural pharmacology, 17(5-6), 431. 4.) Johnstone, A. M., Horgan, G. W., Murison, S. D., Bremner, D. M., & Lobley, G. E. (2008). Effects of a high-protein ketogenic diet on hunger, appetite, and weight loss in obese men feeding ad libitum–. The American journal of clinical nutrition, 87(1), 44-55. 5.) Zhou, W., Mukherjee, P., Kiebish, M. A., Markis, W. T., Mantis, J. G., & Seyfried, T. N. (2007). The calorically restricted ketogenic diet, an effective alternative therapy for malignant brain cancer. Nutrition & metabolism, 4(1), 5. 6.) Musa-Veloso, K., Likhodii, S. S., & Cunnane, S. C. (2002). Breath acetone is a reliable indicator of ketosis in adults consuming ketogenic meals. The American journal of clinical nutrition, 76(1), 65-70. 7.) Kalapos, M. P. (2003). On the mammalian acetone metabolism: from chemistry to clinical implications. Biochimica et Biophysica Acta (BBA)-General Subjects, 1621(2), 122-139. 8.) Anderson, J. C. (2015). Measuring breath acetone for monitoring fat loss. Obesity, 23(12), 2327-2334. 9.) Freund, G. (1965). The calorie deficiency hypothesis of ketogenesis tested in man. Metabolism-Clinical and Experimental, 14(9), 985-990.